One of the home cooked meals that instantly takes me back to my childhood and is one of my all time favorite comfort foods is my mom’s enchiladas. So when she was visiting us recently, I asked her to make them for us, and she happily obliged. Growing up in California, I was always surrounded by great Mexican food, and it was one of my favorite cuisines as a child. But since I’m ethnically Japanese (I’m a third generation Japanese-American – my grandparents immigrated to Hawaii at the turn of the century), Japanese cuisine played a prominent role in my diet as well. For one thing, my family ate Japanese white rice at every dinner. Period. My childhood friends who stayed for dinner would find this strange, and sometimes my mom would offer them toast. Sometimes they would eat the rice with butter and salt, which my brother and I thought was weird. For some time now Japanese cuisine has not been viewed as something alien and exotic (in California no less!) the way it was way back then, so I am dating myself! 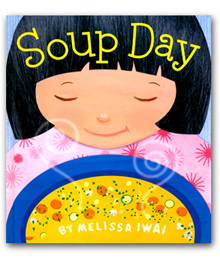 Whether we were eating corned beef and cabbage or Hungarian Goulash, the pot of rice was there on the table. Even on Thanksgiving. My Italian-American friend commented on this as wacky, but did admit that it was similar to his mom serving lasagne with their turkey dinner every year. Anyway, all this is a long winded way of saying that I grew up eating my mom’s enchiladas with Japanese rice, rather than traditionally prepared Mexican rice. 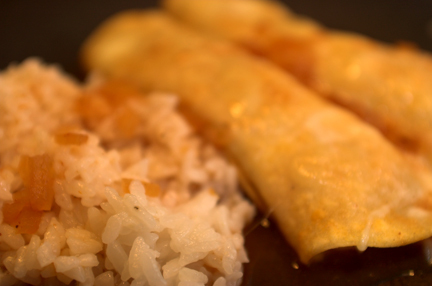 We love the way the sticky rice soaks up all the juicy enchilada sauce. 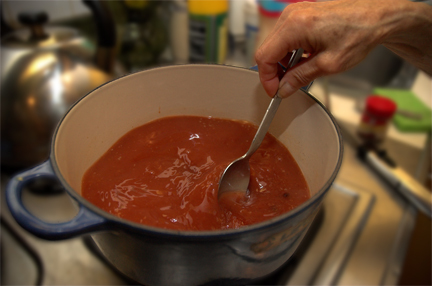 So my mom’s sauce is on the runny side – a little different from most enchilada recipes. If you prefer a thicker sauce, you could just add less chicken stock. Another qualifier: Usually she cooks her own chicken and uses the cooking water as a base of the sauce. But since we were pressed for time, we used a Costco rotisserie chicken (a great short-cut introduced to my by Bebe Love Okazu) and some homemade chicken stock I had in my freezer. Preheat oven to 300 degrees. Heat chicken broth in a large saucepan over medium heat. Add tomato sauce and chili powder and let simmer for about 30 minutes. 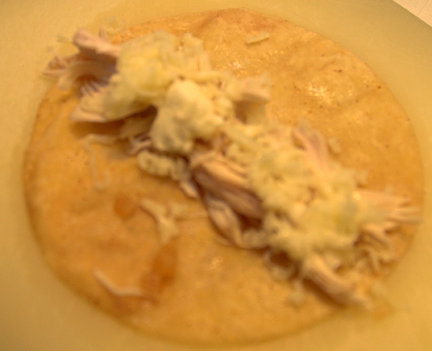 Assemble shredded chicken, shredded cheese and chopped onions on counter top with enough work space to roll enchiladas. Spray two baking sheets with non-stick spray and place six corn tortillas on each sheet. Spray tortillas. Heat one sheet in middle of oven for 4 minutes until tortillas are pliable. (Note: My mom usually heats a saucepan of oil on the stove and dips the tortillas in that to soften them, but I asked her to change her ways after reading about this technique in Cook’s Illustrated,#62). 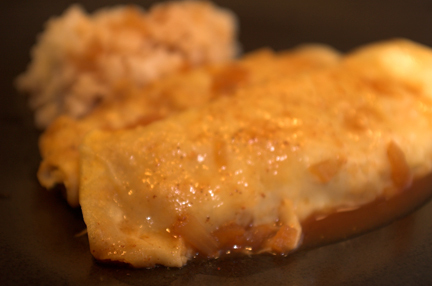 Working quickly, take a warm, pliable tortilla, dip it in enchilada sauce and place it on work area. Fill with some shredded chicken, shredded cheese, and onions. Roll into a tube and place, seam side down, in baking dish. Continue to fill tortillas this way until the dish is filled, heating the second baking sheet of the tortillas as described above when needed. 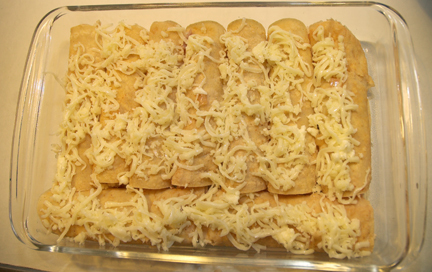 Sprinkle tops of enchiladas with remaining cheese and bake in oven until cheese has melted, about 2-5 minutes. Toss remaining onions in simmering enchilada sauce. Makes 12 enchiladas. You’ll have extra sauce to go with rice! My father is middle eastern and we always had rice on the table too. When I was a kid I always wanted potatoes like all the other kids, but now rice tastes like a home cooked meal. Your enchiladas look pretty tasty, thanks for sharing! Nothing ever tastes quite as good as food our mothers make, does it? Thank you for the link to my site for this beautiful post on cooking with your mom. I love the idea of soupy rice with enchiladas. 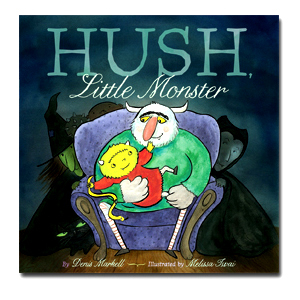 That sounds like something our family does at Thanksgiving with gravy, turkey and rice. 🙂 I will need to try your homemade enchilada sauce – it sounds delicious. hey, where’s a pic of Alice!? melissa, i’m going to have to write about my memories of visiting your house after school and poking around in your refrigerator! You poked around? I don’t remember! Did you ever have the enchiladas? Wow… A long way from those Santa Cruz days of studying kanji! Congrats on all your successes! I can’t wait to try the enchiladas. Good Mexican food is what I miss most here in Tokyo! And we used to have raviolis with our Thanksgiving!